It doesn't get any more Pacific Northwest than Oregon, and the state has some good genealogical, cultural, and historical resources in a variety of online archives that celebrate its Pacific-Northwestiness. For family history work, the Oregon Historical Records Index includes easy surname searching on family history information from death records, censuses, land claims, tax records, and something called "delayed births" (which I've never seen before), and a lot more. For even earlier records, Early Oregonians is an ambition attempt to document pretty much everyone who lived in Oregon prior to 1860. Oregon Trademark Labels offers low resolution images of trademarked businesses in the state from the late 1800s and early 1900s, with high-res copies for sale. Echoes of Oregon (documents from the state's territorial period). Historic Photograph Collections A cooperative project of the Oregon State Archives, Salem Public Library, and Marion County Historical Society. 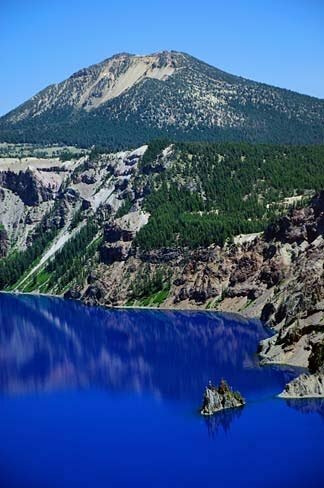 Scenic Oregon Images and Landscape Photos -- even more photos, county by county. You can use the site search, then click the "image" tab in the results to zero in on photos. Over at Oregon State University you'll find more digital archives. The Oregon Multicultural Archives Digital Resources is multi-faceted, ranging from Chinese Disinterment (yes, it's what you think it is) to Braceros as farm labor. OSU has even more at the Special Collections & Archives, with a particularly impressive Natural History collection.